Institutional economics, political economy, industrial organisation and strategic management, innovation systems, policy analysis in the fields of energy, environment, industry and competition. Studies of European Union politics. 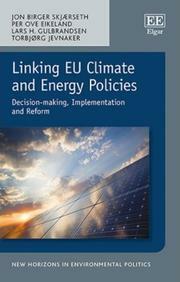 Studies of national energy and climate policies. Studies of environmental strategy and innovation in energy industries. Studies of market diffusion of renewable energy. Cand.mag., Political Science, University of Oslo, 1987, with specialisation in International Economic Policy. Cand.polit., Economics, University of Oslo, 1991, with specialisation in Environmental Economics and Socio-Economic planning. Scholarship, Department of Innovation and Economic Organisation, Norwegian School of Management, 1999-2003. Senior Research Fellow, the Fridtjof Nansen Institute (from 2013). Research Fellow, the Fridtjof Nansen Institute (1994-2013). Scholarship and research associate, Department of Innovation and Economic Organisation, Norwegian School of Management (1999-2003). Lecturer in institutional resource economics, Norwegian University of Life Sciences (1994-1995). Research Assistant, the Fridtjof Nansen Institute (1991-1994). Cheltenham (UK), Edward Elgar, 2016, 265 p.
Corporate Responses to EU Emissions Trading: Resistance, Innovation or Responsibility? Farnham, Ashgate, 2013, 322 p.
Energy system transformation and long-term interest constellations in Denmark: can agency beat structure? Energy Research & Social Science, Vol 11, 2016, pp. 164-173. In Jon Birger Skjærseth and Per Ove Eikeland (eds), Corporate Responses to EU Emissions Trading: Resistance, Innovation or Responsibility? Farnham (UK), Ashgate, 2013, pp. 253-282. In Jon Birger Skjærseth and Per Ove Eikeland (eds), Corporate Responses to EU Emissions Trading: Resistance, Innovation or Responsibility? Farnham (UK), Ashgate, 2013, pp. 1-17. Energi og Klima. 21.12.2016. In Norwegian. Energi og Klima. 14.12.2016. In Norwegian. Per Ove Eikeland, Torbjørg Jevnaker and Jon Birger Skjærseth. Energi og Klima. 1.12.2016. In Norwegian. Dagens Næringsliv, 07.12.2015. In Norwegian.